I love when I can find a pattern for boys that will last for my little guy! He is a string bean, so I generally have to blend sizes to get the width and length right. 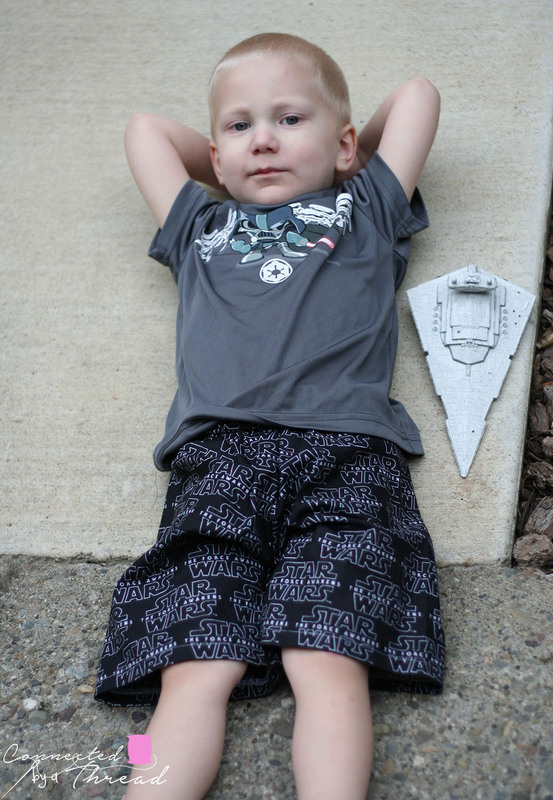 When Denise and I were talking, I mentioned I was looking for shorts patterns for him. She offered up her Boy’s Shorts Pattern for me to sew up and write about. It took me a bit to decide what fabric to use, as nothing was jumping out at me. 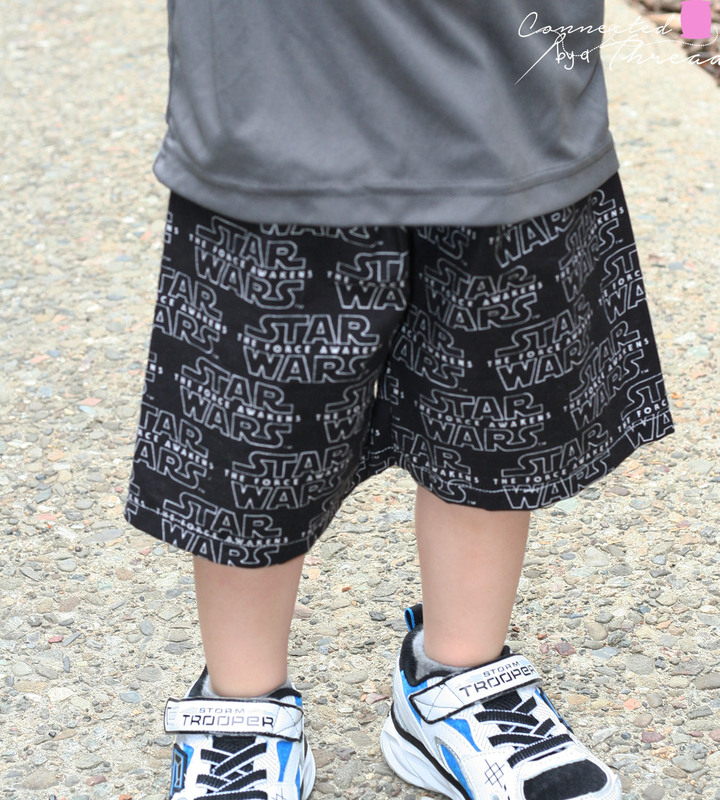 Finally, I remembered I had some Star Wars fabric in a bin, and I thought my almost 3 yr old would love it! It took me 2 full weeks of trying different bribes to get pictures of him in them. These are the simple shorts with no pockets in a straight size 3T. I think the next pair, I will use the slimming option included to slim the legs just a bit for him. This pattern is created a little different. There are no full sized pattern pieces, you cut out a rectangle and fold it and use a template to cut out the crotch curve and slim the legs (if desired). At first, I was a little skeptical of not having the full pattern to lay out and cut, but once I did it, it was much faster! There was no printing 6-8 pages, taping, etc.. I used my rotary cutter and ruler to cut out my rectangles, and had these ready to sew in about 15 minutes! This will be a great pattern for making multiple pair at a time, as I can lay out 3 or 4 fabrics and cut them all out at once! The pattern has clear pictures, with easy to follow written steps. If you run into an issue, Denise is available to help. You can find her in her Facebook group or over at DIY-Crush. Love the shorts, Larissa! Thank you for posting about it! !